PROVIDENCE, R.I. [Brown University] — It’s a wonder of nature — and a darned good thing — that amid many billions of similar cells in the brain and spinal cord, neurons can extend their tendrillous axons to exactly the right place to form connections, otherwise we wouldn’t move, sense, or think properly, if at all. In a new study in the journal Science, researchers report a discovery that helps to explain how axons manage to find their way across the midline of the spinal cord. The findings contribute toward solving the basic mystery of axon guidance, but they might also bring scientists a little closer to achieving the medical aspiration of repairing damage in the central nervous system. The particular discovery of Jaworski and his co-authors is a protein dubbed “NELL2,” which acts like a “Do Not Enter” sign along a growing axon’s route. NELL2 is the first known protein to bind to a critical receptor on neurons known as Robo3. When that binding happens, axon growth diverts away, the team’s experiments show. NELL2 therefore joins a triad of signals that Robo3 handles in regulating axon growth. The presence of Netrin attracts axons expressing Robo3 and a particular subtype of Robo3 allows axons to ignore the repulsive signals provided by yet another protein called Slit. Expressing the Robo3 receptor therefore equips a neuron to grow its axons according to the following rules: they go where they need to (Netrin), steer clear of prohibited areas (NELL2), and ignore prohibitions meant for other neurons, but not for them (Slit). Jaworski started the research while a postdoctoral scholar at Genentech in South San Francisco, Calif., and continued it at Rockefeller University before completing it at Brown, where he arrived two years ago. Over that time he led a series of lab experiments that identified NELL2 as a binding partner for Robo3, showed that its presence repels axons, and demonstrated that the expression of both Robo3 and NELL2 is necessary for axon guidance. He did that work in the model system of the mouse spinal cord. As in the brain, there are distinct left and right sides that are bridged by axons that cross the midline. His work therefore helps to explain what guides those particular axons during crossing. A rare human genetic disorder illustrates the importance of those connections. People with a mutation that prevents them from expressing Robo3 cannot move their eyes from side to side, Jaworski said. That motion is accomplished when a muscle on one side of the eye contracts and a muscle on the other side relaxes. People without Robo3 don’t have axons crossing the midline of the hindbrain and so they don’t transmit opposite signals to opposite sides of the eye. Instead, the muscles on both sides contract and the eye doesn’t move laterally. The next step in Jaworski’s research is to determine whether NELL2 and Robo3 work together in the brain as they do in the spinal cord. 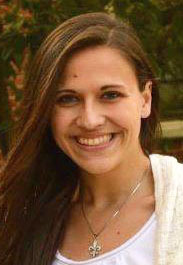 Science co-author and Brown neuroscience senior Holly Gildea is helping to conduct that work. If NELL2 is indeed similarly active in the brain, then the finding could inform future clinical approaches there. Nerves regrow relatively well in most parts of the body, Jaworski said, but in the brain after injury or degeneration neurologists will likely need to guide regrowth. It might not be enough, for instance, to implant some stem cells and turn them into neurons for several reasons. Among those reasons: The blueprint that guides basic neural development doesn’t persist past infancy. In addition to Jaworski and Gildea, the paper’s other authros are Irene Tom, Raymond Tong, Alexander Koch, and Lino Gonzalez of Genentech; and co-corresponding author Marc Tessier-Lavigne of Rockefeller. Genentech, Rockefeller, and Brown supported the research.